This weekend we welcome Father Tim Valentine to St. Mary’s as the new temporary administrator assigned by the bishop. I have no doubt that you will give Fr. Valentine the same warm welcome you gave me when I arrived. It is hard for me to believe that six years have passed since my arrival at St. Mary’s. I am grateful to God for allowing me to serve this wonderful parish as pastor, and I am grateful to all of you. These last few weeks have been challenging, and very emotional for all of us. The farewell gathering in Msgr. Ryan Hall on Sunday afternoon was extraordinary! I thank everyone who worked to put it together on such short notice. It was good to have the opportunity to speak to so many of you. It will take me some time to read all of the cards and letters and open all of the gifts, but I want you to know how much I appreciate them, and the love that comes with them. I leave you with a bit of history. In all my packing, I came across this photograph of St. Mary’s sanctuary as it looked years ago. There is no date on the picture, but I would place it as having been taken in the early 1900’s. The sanctuary is larger; the statues of the Blessed Mother and St. Joseph (the same ones we have today) are on small altars instead of pedestals; there are three steps before the high altar, not two; and the back wall is heavily stenciled. The statues of the Sacred Heart and St. Therese which we have in the back of the Church are in the sanctuary, and there is an altar rail with votive candles directly in front. The ceiling lights look surprisingly similar, and the roundels of Saints Peter and Paul, and the Blessed Mother can all be clearly seen. The pastor at this time was probably Fr. Louis Martel (1900 to 1928). 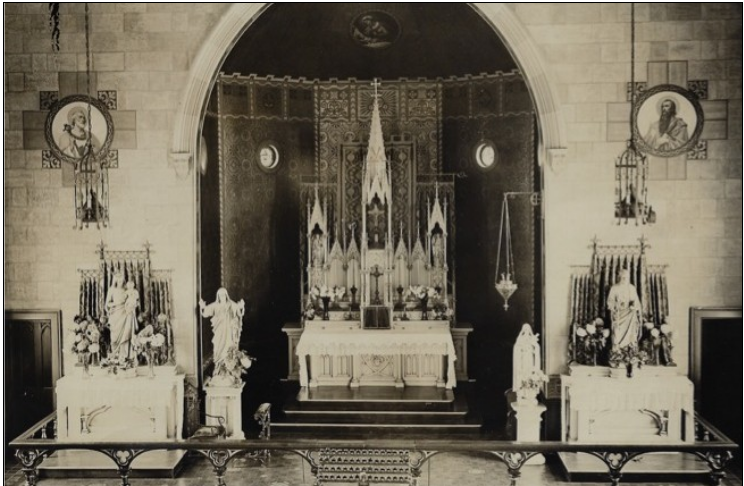 When you look at this photo from nearly a century ago, you can see some differences, yet anyone would instantly recognize this as St. Mary’s Church, Roslyn, where the Catholic faithful have been worshipping for the last 148 years. We must be grateful to those who went before us and preserved it for us. And we must commit ourselves to preserving it for future generations. This picture is a reminder that the most important thing any of us have is our Lord Jesus Christ, and the Catholic Faith He has given us. And we are grateful to Him also for giving us the wonderful gift of our parish, and our beautiful Church, where the faithful will continue to gather to encounter and worship the Lord for years to come.